"Bill Eppridge: An American Treasure" features the historic master vintage print of Busboy Juan Romero trying to comfort Presidential candidate Robert F. Kennedy after assassination attempt, June 5, 1968. Taken by photographer Bill Eppridge, it is the original master print used to reproduce this iconic image in the LIFE magazine issue dated June 14, 1968. 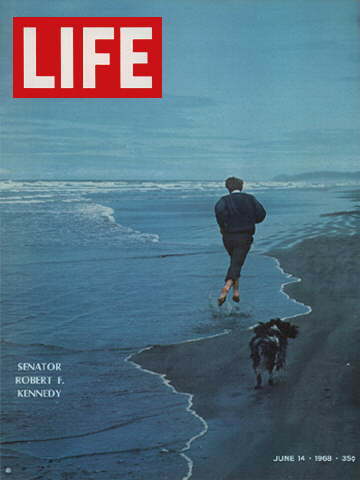 Eppridge's photograph of Robert F. Kennedy running on the beach in Oregon was on the cover. On the night of Senator Kennedy's assassination in Los Angeles, LIFE was closing that week's issue. Bill Eppridge’s negatives were processed in Los Angeles by J.R. Eyerman, and then flown to the Time Life lab in New York for printing. The printer was Carmine Ercolano, and he made only one master print for reproduction purposes. The negative was very thin, and the face of the busboy had to be airbrushed to bring out his features. The airbrushing is visible on the print, as are the pencil instructions along the bottom in the white border. This master print was later copied on a 4 x 5 camera, in the Time Life lab, and all future reproductions were made using a copy negative. The master print was given to Bill Eppridge by Doris O'Neill, then the Director of the Time Life Picture Collection, shortly after LIFE magazine ceased weekly publication in 1972. Bill Eppridge was reluctant to display the print in his home in Laurel Canyon, and he placed it behind a sofa. Sometime later, a canyon fire destroyed his home. When Bill returned to the house to retrieve belongings, he found the print had burned around the edges, but had survived the fire. "An artifact is a human-made object that gives information about the culture of its creator and its users, and reflects their social behaviors. An icon, from the Greek "image", is a representation that is used, particularly in modern culture, as a symbol representing something of greater significance. "Several 20th-century photographs have attained icon status but few are considered artifacts. 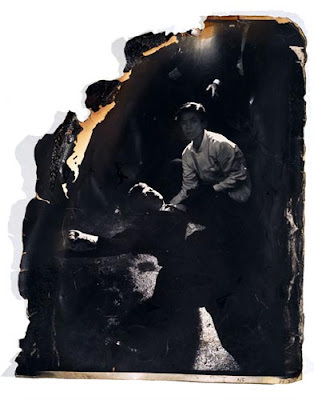 One example is Bill Eppridge's damaged photograph of Bobby Kennedy as he lay wounded in a kitchen passageway in Los Angeles. "But how does one value such an object? What comparables are appropriate? Would it be possible to compare it with the film footage shot by Abraham Zupruder that captured President Kennedy's assassination in Dallas in 1963? That film was deposited with the National Archives in 1978 by the family for safekeepimg. In 1992 a Federal law required all records of the assassination be transferred to the National Archives, passing ownership to the government. It acknowledged that the Zapruder family was entitled to reimbursement as owners of private property taken by the government for public use, but establishing the value was difficult. the case eventually went to arbitration, and a three-member panel awarded $16 million to the family, the highest amount ever paid for a historical artifact. One of the panel members disagreed - he thought that $3 - $5 million would have been more realistic, as the family had always controlled the licensing of images from the film. The issue lay with the value of the original film strip as a collectible object. Since there have been no documented sales of any other historically significant original film strips, the dissenting member of the panel felt the value was in the image and not in the film strip itself. Like the film, the burned photograph belongs in a national museum - however, valuing it will be difficult because the event and the object are so emotionally charged that it will be difficult for any appraiser to remain dispassionate." "Bill Eppridge: An American Treasure" continues through September 26, 2010. Watch Bill Eppridge discuss events leading to the night of the assassination in this trailer from the forthcoming documentary "The Eye of The Storm". Related: A Civil Rights Legacy: Neshoba and The Price of Freedom.